The sunshade will be opened with the glass panel automatically when the glass panel is slid. You will have to close it manually if you want it closed. Do not extend face, neck, arms or body outside through the sunroof opening while driving. Make sure hand and face are safely out of the way before closing a sunroof. Do not press any sunroof control button longer than necessary. Damage to the motor or system components could occur. Periodically remove any dirt that may accumulate on the guide rail. If you try to open the sunroof when the temperature is below freezing or when the sunroof is covered with snow or ice, the glass or the motor could be damaged. 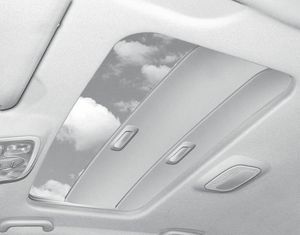 The sunroof is made to slide together with sunshade. Do not leave the sunshade closed while the sunroof is open.